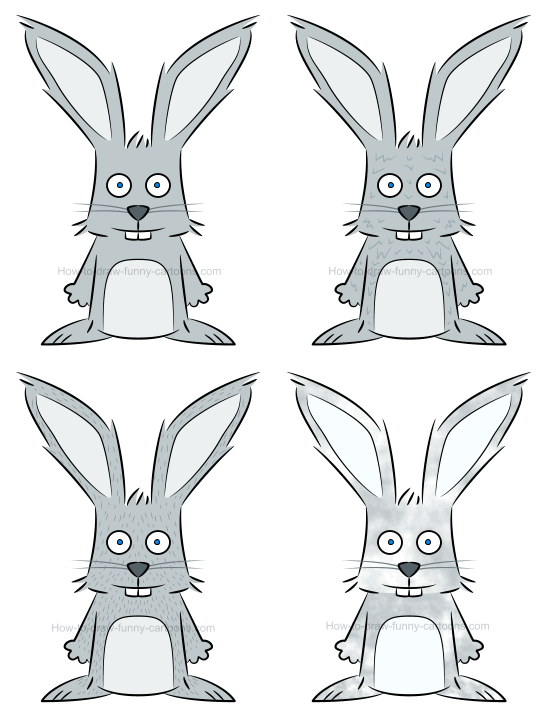 Sketch and draw a wonderful illustration of a rabbit and then see three different options for creating basic textures on the character. 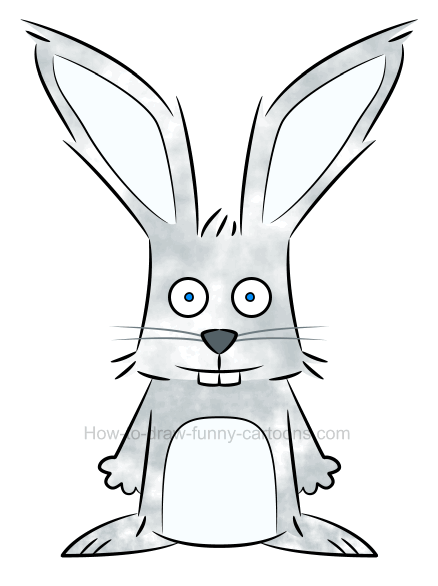 Rabbits have wonderful features that are fun and amusing to illustrate. 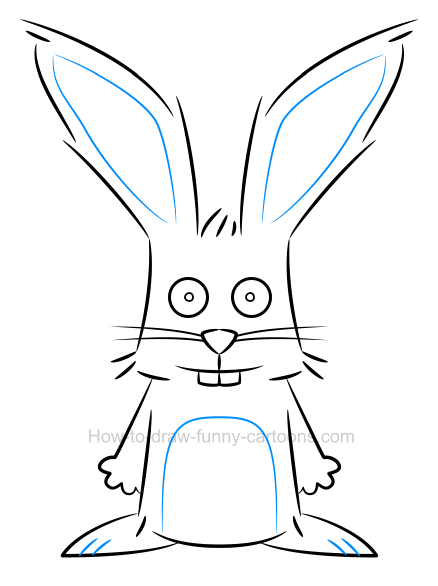 Gifted with long ears, tiny teeth and long feet, I will show you how to draw a cartoon rabbit mostly made from basic shapes and multiple curved lines. However, it might be a good idea to take a closer look at this character before proceeding with the step-by-step tutorial. Indeed, there are a few things you should know about this animal that can help you create a more realistic illustration. Some hair are visible on the ear of the animal. Bright patches are added inside the ears. You can also see some hair on top of the head of the rabbit. Ears are long, thin and pointed near the end. Both eyes and pupils are made from small circular shapes. Whiskers are done using small pointed lines. More hair can be seen on both cheeks. Hands are small and made from small curved lines. Don't forget to sketch long feet filled with small lines. Another patch can be seen on the chest of the character. The body is narrower than the head. Two small teeth are drawn below the mouth. The nose is small and made from a triangle. The first thing we can do is draw a few basic shapes to help us sketch accurate proportions. 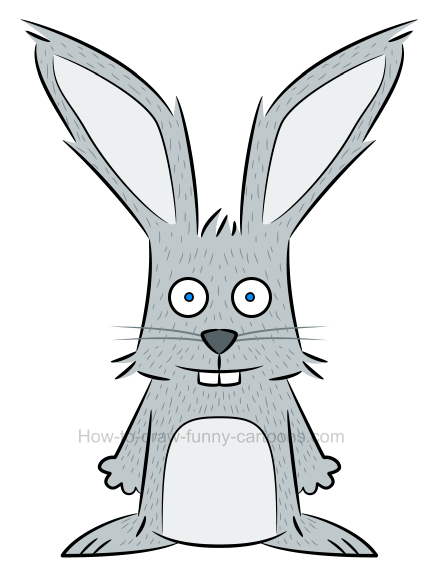 This template will be used to illustrate the rabbit. You can start by sketching two large rectangles to form the head and the body. Both ears are made from long and thin oval shapes. Four more oval shapes are needed to represent the arms and the feet of the animal. step 2 - Let's draw this illustration of a rabbit! 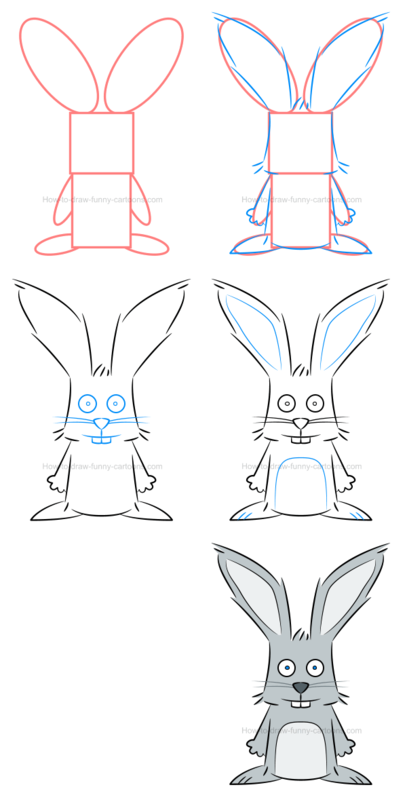 Using mostly a mix of short and long curved lines, you can now draw the character using the shapes created previously. Once all body parts are accurate and well-drawn, you can erase all orange shapes that were added to create the guideline. Cool! Let's move on to the next step! 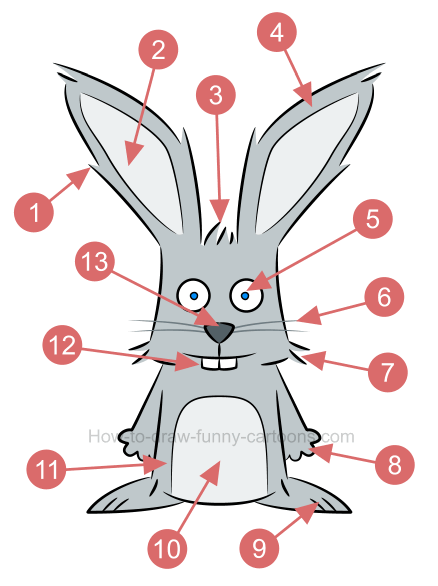 Now that most body parts are added, let's work inside the head of the animal. You can start by drawing the eyes and the pupils using small circles. The nose is made from two lines that are drawn like a single triangle. Whiskers are made from long curved lines while the mouth and the teeth are also made from basic lines. This illustration of a rabbit is almost completed. Inside the ears, sketch more lines to form patches. Another long curved line is drawn on the chest of the character. Finally, you can draw long straight lines inside the feet to end this part of the tutorial. All we need to do is add some colors! Blue might not be a realistic color for a rabbit, but it can be a nice alternative for a cartoon version of this animal. Of course, I did not select a bright blue color. Instead, a subtle version is added inside the head, the body and the feet. You can make all three patches brighter and the nose darker. Good work ... but we are not done yet! Below you can see all five steps required to draw this animal properly. 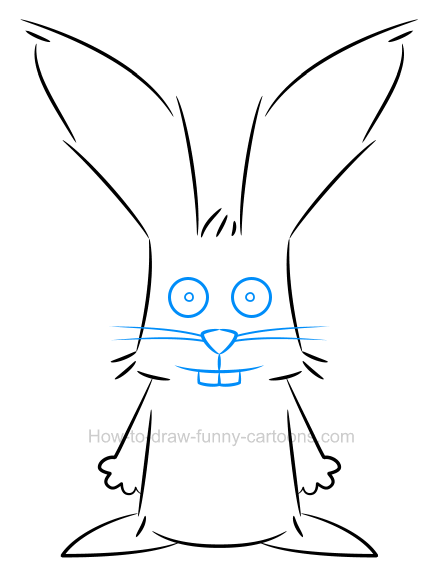 In just five easy steps, you can draw a cartoon rabbit that is adorable and visually amazing. Now let's see how we can add a little bit of texture inside this character to make the image more appealing. As you can see below, our goal is not to draw complex and realistic texture on the animal. Instead, we are simply looking for an effective way to make this rabbit more enjoyable simply by sketching a few basic lines. In this example, a few broken lines were added on the head and the body of the character. More lines ... but straight ones! 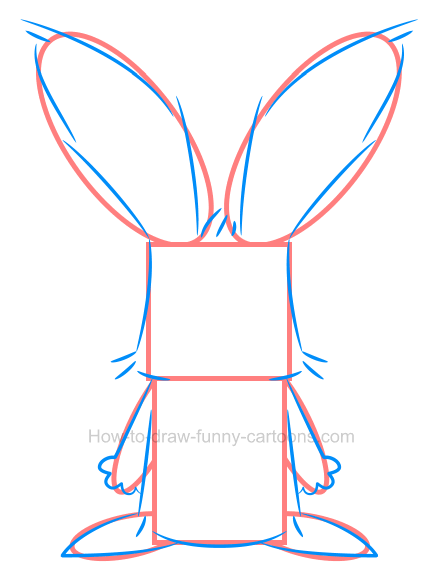 In this second alternative, additional lines were added on the ears, the head, the body and the feet of the cartoon rabbit. This version is definitely more convincing than the previous one, but it's also more time-consuming to achieved. A nice technique that could be used on several cartoon animals. These are simple examples. you can do better!